Robert Kubica says his first F1 test in six years felt like an achievement but also showed him what he had lost as a result of his rallying accident in 2011. Driving a 2012-spec Lotus E20 painted in Renault colours, Kubica completed 115 laps of the Ricardo Tormo circuit in Valencia -- the same venue he last drove an F1 car before his career was cut short by a brutal rallying accident in 2011. The accident partially severed his right arm and, despite making a remarkable recovery, he was still left with reduced mobility in his wrist and forearm that prevented an immediate return to single seaters. "I would like to thank everybody for making this possible, I hope it was a good day for everyone and maybe they saw something of my old, 2010 self," he said following Tuesday's test. "For me, it has been an important day from an emotional point of view. It has been a long time away from the paddock and I have been through difficult periods, I kept working hard and a few years ago I felt it was impossible. I have mixed feelings, I am proud with what I achieved today, but also it shows what I have lost. "I don't know what the future will bring, but I know one thing, after working for more than one year to prepare for this, I ran with good pace and consistent in difficult conditions. It is not easy after six years, but I knew I could do the job and I can be satisfied. I appreciate the opportunity. Renault gave me my first F1 test in 2005, so I appreciate another test this time around." 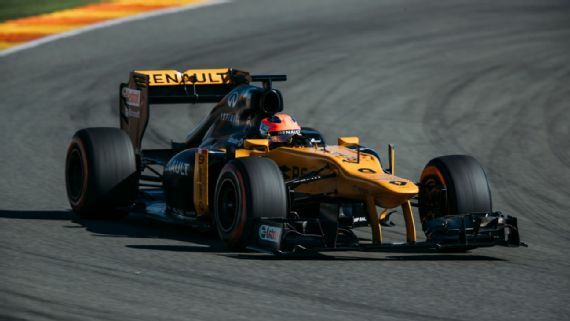 Although no lap times were revealed, Renault's sporting director Alan Permane -- who worked with Kubica when he was at the team in 2010 and 2011 -- said the Pole had performed well during the test. "It was good to see Robert back in a Formula 1 car. It was a smooth day. We tried to condense a Grand Prix weekend into one day, which was interesting for him. Robert has changed a little, he is more mellow and he wasn't as pushy when asking for every detail about the set-up of the car! His comments and feedback, however, were like turning the clock back for all of us. "It is a tricky thing to jump into an F1 car after six years and it was a great performance from him. This was a one-off event for Robert. His time with Renault was cut short so abruptly and we perceived such a nice future with him. The team was in Valencia testing with Sergey Sirotkin, so it was the perfect opportunity to offer Robert a day in the car and contribute in our way to his recovery." Kubica only won one race in his career, but was tipped for big things and at the time of his accident had an option to join Ferrari in 2013. Since 2011, he has he has driven in the World Rally Championship, raced GT cars and was set to make a full return to circuit racing this season in the World Endurance Championship before pulling out on the eve of the first event.